In the summer of 1970 McQueen and author Michael Munn took a road trip in England while the actor's film Le Mans was on hold. McQueen told stories of being a kid on the street, petty theft, rolling drunks, gangs and losing his virginity to a whore who took cakes in exchange for sexual favours. Munn met McQueen on other occasions, last speaking in 1980, and in this poignant, personal account, recalls the story of one of the greatest American anti-heroes of all time. Dubbed the King of Cool, his life was anything but. His childhood was hard - he rarely attended school and didn't like to sleep at home where his mother entertained men. Full of anger, the young McQueen suffered trying to control it - indeed, it became part of his acting persona. He once stole a knife from a butcher's store and went home to kill his mother and stepfather. 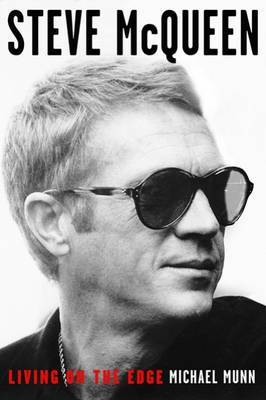 McQueen spent time in a school for wayward children and joined the merchant navy, escaping to become a towel boy in a brothel in the Dominican Republic, before returning to the US to steal cars and break into stores and houses. He joined the Marines before finally falling into acting. This is the fascinating story of McQueen from boyhood to American superstar: a complicated man who could be difficult to work with but also a delight, have many famous lovers yet be paranoid and jealous. The author has interviewed a host of stars and directors to get closer to the true character of this extraordinary man.